This review focuses on populations where systems involvement is presumed to impact the size, strength, and supportiveness of social networks, including young people who have experienced out-of-home placement in foster care, juvenile justice, or residential treatment. It is widely understood that social networks profoundly influence health and well-being, and addressing social isolation and strengthening ties between people is a "grand challenge" for interdisciplinary research and practice (Lubben, et al., 2015). This is in line with evidence linking inadequate social networks—in terms of social isolation, limited social ties, and network influence on health practices—with a range of health and well-being outcomes (see Lubben, et al., 2015, for review). Although the influence of social networks on physical and mental health is complex, it can be understood as occurring through four primary pathways: the provision of social support, social influence, social engagement and attachment, and access to material resources (Berkman, Glass, Brissette, & Seeman, 2000). It follows that youth and young adults would rely on stable and supportive social networks, and that poor developmental outcomes are more likely to occur in the absence of such networks. This may be especially true for young people with mental health conditions, who are also more likely to experience systems involvement during adolescence. This review specifically focuses on populations where systems involvement is presumed to impact the size, strength, and supportiveness of social networks, including young people who have experienced out-of-home placement in foster care, juvenile justice, or residential treatment. However, the reasoning applies to those who may have experienced other types of adverse social network disruptions during adolescence, such as frequent changes in where they live and go to school (for example, youth experiencing homelessness, youth in military families). 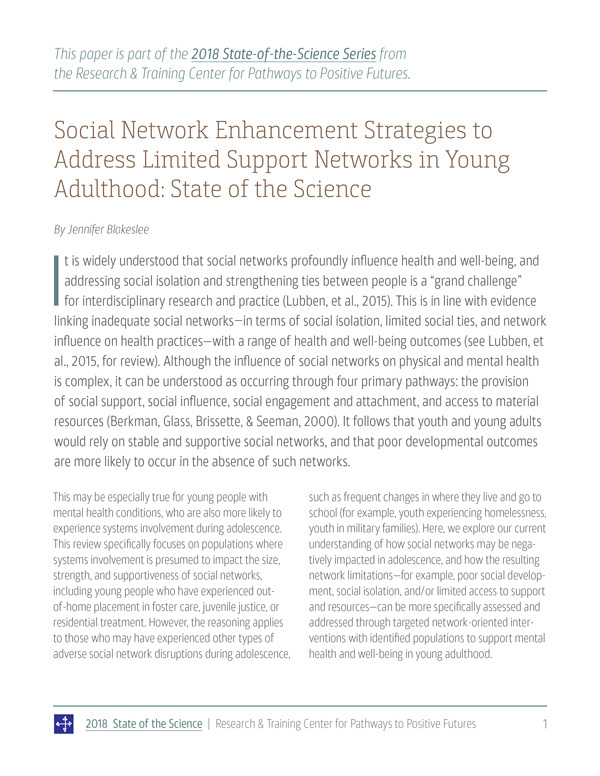 Here, we explore our current understanding of how social networks may be negatively impacted in adolescence, and how the resulting network limitations—for example, poor social development, social isolation, and/or limited access to support and resources—can be more specifically assessed and addressed through targeted network-oriented interventions with identified populations to support mental health and well-being in young adulthood. Importantly, strong and supportive family and community networks are influential in facilitating positive development and preventing psychological and behavior problems in older adolescence and young adulthood (Brooks, Magnussen, Spencer, & Morgan, 2012; IOM and NRC, 2013; McPherson et al., 2013). Normative adolescent development—including physical health, psychological and emotional well-being, life skills, healthy family and social relationships, and engagement in school, work, and civic life (Scales et al., 2015)—is generally facilitated in the socio-ecological context of stable family, school, and community networks. It is assumed that such network stability and support is lacking for many young people due to a wide variety of circumstances, and it can therefore be helpful to consider specific populations who have experienced known social network disruption, in this case due to specific kinds of system involvement. For example, we can imagine that out-of-home placement experiences during adolescence—whether these were due to child welfare involvement, receiving inpatient mental health treatment, or being detained through the juvenile justice system—would be associated with detrimental social network disruption. This is because the social contexts through which adolescents developmentally benefit in ways that support overall health and wellness—e.g., family-based networks, connectedness to schools and recreation, and relationships with prosocial peers—are likely disrupted or inhibited by the experiences that led to service system involvement, if not by the experience of out-of-home placement itself. Further, there is reason to expect a prevalence of mental health challenges associated with out-ofhome placement and the attendant social network disruption. For example, there is consensus in child welfare research and practice that such network-based support is a crucial—and too often scarce—developmental resource for young adults who age out of foster care at age 18-21 (e.g., Avery, 2010; Goodkind et al., 2011). Broadly, young people served by the child welfare system demonstrate lower levels of health and well-being, including high rates of developmental delay or neurological impairment, relatively poor social skills and daily living skills, and significantly elevated problem behaviors and poor psychosocial functioning (Lou et al., 2008, citing HHS, 2001). Further, there is evidence that child welfare involvement itself impacts networks in ways that can affect the health and well-being of young people in care. For example, we know there is a large subgroup of older foster youth who likely experience repeated network disruption related to placement instability (Courtney, et al., 2001; McCoy et al., 2008; McMillen & Tucker, 1999), non-relative foster care or group homes (Keller et al., 2007; Wulczyn et al., 2003), and residential treatment (McMillen & Tucker, 2009). Such repeated temporary placement experiences likely result in sparse networks (Collins, 2010; Perry, 2006), disengagement from services (Goodkind, et al., 2011; Keller et al., 2007; McCoy et al., 2008), problem behaviors (James et al., 2004; McCoy et al., 2008; Newton et al., 2000; Shook et al., 2011) and other social adjustment challenges (Samuels & Pryce, 2008; Unrau et al., 2008), all of which further impact the support capacity of their networks. Considering the developmental impact of the family-based network in particular, we see clear subgroups of foster older adolescents experiencing problematic functioning, with consistent associations between socioecological context, in terms of whether they are living in a group placement or foster family setting, where the latter have better behavioral and social functioning as they exit care (Keller et al., 2007; Miller et al., 2017; Shpiegel & Ocasio, 2015; Yates & Grey, 2012). Specifically, we also know that young people in foster care have elevated mental health diagnoses and service use, but are less likely to be engaged in mental health and other services as they exit foster care, and have fewer informal supports to rely on after exit. Older foster youth have 37% past-year psychiatric disorder (61% in lifetime), with twice the rate of depression and PTSD (Havlicek et al., 2013; McMillen et al., 2005). At age 17, 70% had behavioral health needs, and more than a third had diagnosed depression or substance dependence (Courtney at al., 2014). Further, although mental health service use is higher for foster youth compared to same-age peers and child welfare-involved youth who remain in the home (Brown, Courtney, & McMillen, 2015), these service needs are not always met. At age 17, about half with service needs were receiving services; at age 24, service need is 40%, and only one-third with needs are receiving services. (Courtney at al., 2014; Brown et al., 2015). Whether young people remain in foster care past age 18 or not, behavioral health needs (poor mental health, substance dependence, and antisocial behavior) remain high upon the exit from care, but behavioral health service receipt drops precipitously, outpacing expected developmental abatement of these needs in early adulthood (Brown. Courtney, & McMillen, 2015; McMillen & Raghavan, 2009; Vaughn et al., 2007). Importantly, young people in foster care are also more likely to indicate that it is "inadvisable, impossible, risky, or useless" to seek help from others, especially if they have had multiple placements or are aging out of care, where those exiting to permanency have a more positive network orientation (Seita, Day, Carrellas, and Pugh, 2016). This perspective has been called "survivalist self-reliance" (Samuels & Pryce, 2008), and reflects hard-earned resilience among young people who often exit foster care lacking typical supportive relationships. This transition can be visualized as the falling away of a formal network of service providers, potentially in the absence of informal resources usually available through stable connections to cohesive family, school, or community networks (Blakeslee, 2012). Thus, transition-age foster youth are at a critical developmental stage, where network–oriented intervention to increase social engagement and interdependency may be able to bridge the expected shift from formal to informal sources of support (Antle, Johnson, Barbee, & Sullivan, 2009; Paulsen & Berg, 2016; Singer, Berzin, & Hokanson, 2013). Research shows that this approach is also warranted for young people in various types of out-of-home care, especially given the overlap of young people served by mental health, child welfare, and/or juvenile justice systems, and the prevalence of mental health conditions—and related impact on social integration and help-seeking—expected across these populations. For example, the experience of inpatient psychiatric treatment may impact youth social development and community participation. A systematic review of qualitative studies reporting the experiences of young people living with mental illness highlights common themes around feeling uncomfortable in their body and world, including fear of rejection by family and friends, reliance on both positive and negative strategies to cope, and challenges in seeking mental health care (Woodgate, et al., 2017). Relatedly, young people aged 13-24 in psychiatric outpatient treatment report fears of pejorative viewpoints towards those with mental illness and stigma within their families and social networks (Elkington, et al., 2012). Further, these trends apply to young people with juvenile justice involvement, who also experience prevalent mental health diagnoses with limited treatment, where detention can specifically exacerbate these conditions and inhibit typical social integration. Overall, 50–70% of youth involved in juvenile justice have a mental health condition, and rates are higher among residential or detention facilities (Skowyra & Cocozza 2006; Teplin et al. 2002; Wasserman et al. 2005). At first-time adjudication, three-quarters met criteria for mood, anxiety, or behavioral disorder, and only 20% had follow-up mental health service use (Burke, Mulvey, & Schubert, 2015). At first detention, 60–70% met criteria for at least one disorder (Teplin et al., 2002), and diagnosis is 40–50% at five year follow-up (Abram at al., 2007). The literature suggests that incarceration impairs positive development, healthy transitions to adulthood, and community integration (Lambie & Randell, 2013), where incarcerated youth are less equipped with psychological or social skills to live independently, and face difficulties transitioning from the institution and reintegrating into the community, including making friends (Altschuler & Brash, 2004; Steinberg, Chung & Little, 2004). Further, the stigma associated with convictions may limit access to conventional social networks, employment, and responsible reengagement with the community, and youth can doubt their ability to be successful (Mears & Travis, 2004). Overall, researchers and practitioners working with these various populations recognize that experiences of out-of-home placement—if not the complex individual and environmental factors that lead to such placement—impact social networks in ways that might limit typical social development and community integration. Further, limited social support networks can exacerbate mental health challenges experienced by many young people who have histories of foster care placement, juvenile justice involvement, and/or inpatient psychiatric treatment. Lastly, we know that young people can be difficult to engage in traditional mental or behavioral health treatment in emerging adulthood (e.g., Pottick, Bilder, Vander Stoep, Warner, & Alvarez, 2008), when they are also navigating the transition from child to adult service systems (e.g., Broad, Sandhu, Sunderji, & Charach, 2017) and developing increasing independence. Thus, many are considering research evidence and intervention approaches that directly address social development and community participation as a protective factor. For example, a growing body of research identifies the important role of non-parental adults as sources of multi-dimensional support for older foster youth as they enter young adulthood (Ahrens., et al., 2011; Munson & McMillen, 2009), and recent efforts have addressed the development of supportive ties as a primary outcome (Greeson et al., 2014; Nesmith & Christophersen, 2014). Others have argued that a network-informed perspective on foster youth transition can focus on assessing the capacity of youth support networks and guide services that can directly facilitate adding supportive new people to youth networks through programming, and also assist young people in developing skills to maintain these relationships (Blakeslee, 2011; Blakeslee & Keller, 2016). Additionally, social participation interventions are a viable approach for directly addressing the social isolation that many people with mental health challenges experience, as demonstrated by a new systematic review of 19 social participation interventions for people receiving mental health services (Webber & Fendt-Newlin, 2017). Tested approaches include group skills training (manualized sessions with young people with anxiety and depression) to enhance social group identification and social functioning and to reduce loneliness (Haslam, Cruwys, Haslam, Dingle, & Geurtz, 2016). Other related approaches are supported community engagement in line with an individual's identified participation interests, and peer support models, such as minimally- guided peer support groups and the inclusion of peer staff to assist mental health case managers in facilitating social support and participation (Webber & Fendt-Newlin, 2017). These promising network-oriented approaches fit into the Pathways to Positive Futures theory of change model (Walker, 2015), which describes how a positive development intervention approach can increase application of developmental skills as young people with mental health challenges build positive connections to various contexts (family and friends, community and culture, etc.) and acquire role- and context-related skills and knowledge that improve quality of life and well-being. Importantly, such approaches include peer groups that are "intentionally organized to function as important positive developmental context" where members inspire, role model, mentor, and advocate for each other (p. 139). However, few positive development models exist that use network-oriented strategies to specifically address network deficits among subgroups of young people who have experienced known social network disruption due to systems involvement and who are likely to have mental health challenges in young adulthood. Some evidence-based models address comprehensive outcomes, such as year-long weekly skill-building with foster youth (Powers et al., 2012), and longer-term Wraparound facilitation in mental health services (Bruns et al., 2010), but such approaches only tangentially address social network deficits as one of many aims. New and replicable models are needed that can be integrated in larger systems to specifically introduce a positive development approach to addressing social network deficits among identified populations potentially experiencing network disruption and mental health challenges. The Research and Training Center for Pathways to Positive Futures at Portland State University is currently piloting two different models that combine promising social participation, community integration, and peer support strategies in innovative ways to enhance social development and network integration among young people who have experienced mental health challenges and known network disruption. The first, Project FUTURES, is a near-peer coaching model to increase self-determination skills among young people transitioning from foster care who experience mental health challenges and are attending college. The FUTURES model adapts a self-determination skill-building curriculum that has been used in other interventions for young people in foster care (e.g., Powers et al., 2012; Geenen et al., 2013) and young people receiving Wraparound mental health services (Achieve My Plan; Walker, Seibel, & Jackson, 2017). The FUTURES adaptation uses near-peer coaching by young people who are further along in college who also have lived experience with foster care and/or mental health challenges, and was originally tested as a successful near-peer model when young people were in high school (Geenen et al., 2015; Phillips, et al., 2015). FUTURES coaches are trained to support post-secondary students in identifying self-determined goals related to academic achievement, including succeeding in the campus context (e.g., working with professors to improve class performance), managing mental health stressors (e.g., connecting to campus-based services), and any related social goals (e.g., making new peer connections, joining student groups). Importantly, FUTURES also maintains Campus Champions, who are trained faculty and staff from student services (e.g., advising, financial aid) and academic departments across campus. Campus Champions are invited to share their knowledge and experience at FUTURES workshops and other events, and they generally serve as an identified resource available to support students with foster care histories and mental health challenges, as well as other underrepresented groups across campus. Additionally, Pathways RTC is currently developing the new Meaningful Networks Model (MNM) program curriculum to enhance social network development and community participation among young adults who are either experiencing or at risk for serious mental health conditions, and who are also expected to have limited support networks due to histories of out-of-home placement. For example, these may be young people with SMHC who: have histories of outof- home placement through the mental health, child welfare, and/or juvenile justice systems; are currently in group placement or residential treatment, and are expected to exit from these living situations into independence; and/or are relatively socially isolated or overly self-reliant (e.g., those who largely rely on paid providers for support, or those with lived experiences in "the system" that lead them to reject formal support services). Abram, K.M., Washburn, J.J., Teplin, L.A., Emanuel, K.M., Romero, E.G., & McClelland, G.M. (2007). Posttraumatic stress disorder and psychiatric comorbidity among detained youths. Psychiatric Services, 58(10), 1311-1316. Ahrens, K.R., DuBois, D.L., Garrison, M., Spencer, R., Richardson, L.P., & Lozano, P. (2011). Qualitative exploration of relationships with important non-parental adults in the lives of youth in foster care. Children and Youth Services Review, 33, 1012-1023. Altschuler, D.M., & Brash, R. (2004). Adolescent and teenage offenders confronting the challenges and Opportunities of reentry. Youth Violence and Juvenile Justice, 2(1), 72-87. Antle, B., Johnson, L., Barbee, A., & Sullivan, D. (2009). Fostering interdependent versus independent living in youth aging out of care through healthy relationships. Families in Society: The Journal of Contemporary Social Services, 90(3), 309-315. Avery, R.J. (2010). An examination of theory and promising practice for achieving permanency for teens before they age out of foster care. Children and Youth Services Review, 32, 399-408. Berkman, L.F., Glass, T., Brissette, I., & Seeman, T.E. (2000). From social integration to health: Durkheim in the new millennium. Social Science & Medicine, 51(6), 843-857. Blakeslee, J.E. (2012). Expanding the scope of research with transition-age foster youth: Applications of the social network perspective. Child & Family Social Work, 17(3), 326-336. Blakeslee, J.E. (2015). Measuring the support networks of transition-age foster youth: Preliminary validation of a social network assessment for research and practice. Children and Youth Services Review, 52, 123-134. Blakeslee, J.E., & Keller, T.E. (2016). Assessing support network stability with transition-age foster youth: Measuring change over time. Research on Social Work Practice, DOI: 1049731516678662. Broad, K.L., Sandhu, V.K., Sunderji, N., & Charach, A. (2017). Youth experiences of transition from child mental health services to adult mental health services: A qualitative thematic synthesis. BMC Psychiatry, 17(1), 380. Brooks, F.M., Magnusson, J., Spencer, N., & Morgan, A. (2012). Adolescent multiple risk behaviour: An asset approach to the role of family, school and community. Journal of Public Health, 34(S), i48-i56. Brown, A., Courtney, M.E., & McMillen, J.C. (2015). Behavioral health needs and service use among those who've aged-out of foster care. Children and Youth Services Review, 58, 163-169. Bruns, E.J., Walker, J.S., Zabel, M., Matarese, M., Estep, K., Harburger, D., ... & Pires, S.A. (2010). Intervening in the lives of youth with complex behavioral health challenges and their families: The role of the wraparound process. American Journal of Community Psychology, 46(3-4), 314-331. Burke, J.D., Mulvey, E.P., & Schubert, C.A. (2015). Prevalence of mental health problems and service use among first-time juvenile offenders. Journal of Child and Family Studies, 24(12), 3774-3781. Collins, M.E., Spencer, R., & Ward, R. (2010). Supporting youth in the transition from foster care: Formal and informal connections. Child Welfare, 89(1), 125. Courtney, M.E., Charles, P., Okpych, N.J., Napolitano, L., Halsted, K., & Courtney, M.E. (2014). Findings from the California Youth Transitions to Adulthood Study (CalYOUTH): Conditions of foster youth at age 17. Chicago, IL: Chapin Hall at the University of Chicago. Courtney, M.E., Piliavin, I., Grogan-Kaylor, A., & Nesmith, A. (2001). Foster youth transitions to adulthood: A longitudinal view of youth leaving care. Child Welfare, 80(6), 685-717. Elkington, K.S., Hackler, D., Walsch, T.A., Latack, J.A., McKinnon, K. Borges, C., Wright, E.R., & Wainberg, M.L. (2012). Perceived mental illness stigma, intimate relationships, and sexual risk behavior in youth with mental illness. Journal of Adolescent Research, 28(3) 378-404. Geenen, S., Powers, L.E., Phillips, L.A., Nelson, M., McKenna, J., Winges-Yanez, N., ... & Swank, P. (2015). Better Futures: A randomized field test of a model for supporting young people in foster care with mental health challenges to participate in higher education. The Journal of Behavioral Health Services & Research, 42(2), 150-171. Geenen, S., Powers, L.E., Powers, J., Cunningham, M., McMahon, L., Nelson, M., ... & Research Consortium to Increase the Success of Youth in Foster Care. (2013). Experimental study of a self-determination intervention for youth in foster care. Career Development and Transition for Exceptional Individuals, 36(2), 84-95. Goodkind, S., Schelbe, L.A., & Shook, J.J. (2011). Why youth leave care: Understandings of adulthood and transition successes and challenges among youth aging out of child welfare. Children and Youth Services Review, 33(6), 1039-1048. Greeson, J.K., Garcia, A.R., Kim, M., & Courtney, M.E. (2014). Foster youth and social support: The first RCT of independent living services. Research on Social Work Practice, 25(3), 349-357. Haslam, C., Cruwys, T., Haslam, S.A., Dingle, G., & Chang, M.X.L. (2016). Groups 4 Health: Evidence that a social-identity intervention that builds and strengthens social group membership improves mental health. Journal of Affective Disorders, 194, 188-195. Havlicek, J.R., Garcia, A.R., & Smith, D.C. (2013). Mental health and substance use disorders among foster youth transitioning to adulthood: Past research and future directions. Children and Youth Services Review, 35, 194-203. IOM (Institute of Medicine) and NRC (National Research Council). (2013). Improving the health, safety, and well-being of young adults: Workshop summary. Washington, DC: The National Academies Press. James, S., Landsverk, J., & Slymen, D.J. (2004). Placement movement in out-of-home care: Patterns and predictors. Children and Youth Services Review, 26, 185. Keller, T.E., Cusick, G., & Courtney, M.E. (2007). Approaching the transition to adulthood: Distinctive profiles of adolescents aging out of the child welfare system. Social Service Review, 81(3), 453-484. Lambie, I., & Randell, I. (2013). The impact of incarceration on juvenile offenders. Clinical Psychology Review, 33(3), 448-459. Lou, C., Anthony, E.K., Stone, S., Vu, C.M., & Austin, M. J. (2008). Assessing Child and Youth Well-Being: Implications for Child Welfare Practice. Journal of Evidence-Based Social Work, 5(1-2), 91-133. Lubben, J., Gironda, M., Sabbath, E., Kong, J., & Johnson, C. (2015). Social isolation presents a grand challenge for social work (Working Paper No. 7). Grand Challenges for Social Work Initiative: American Academy of Social Work and Social Welfare. McCoy, H., McMillen, J., & Spitznagel, E. (2008). Older youth leaving the foster care system: Who, what, when, where, and why? Children and Youth Services Review, 30, 735-745. McMillen, J., & Tucker, J. (1999). The status of older adolescents at exit from out-of-home care. Child Welfare, 78(3), 339-360. McMillen, J.C., Zima, B.T., Scott Jr, L.D., Auslander, W.F., Munson, M.R., Ollie, M.T., & Spitznagel, E.L. (2005). Prevalence of psychiatric disorders among older youths in the foster care system. Journal of the American Academy of Child and Adolescent Psychiatry, 44(1), 88-95. McMillen, J.C., & Raghavan, R. (2009). Pediatric to adult mental health service use of young people leaving the foster care system. Journal of Adolescent Health, 44(1), 7-13. McPherson, K.E., Kerr, S., Morgan, A., McGee, E., Cheater, F.M., McLean, J., & Egan, J. (2013). The association between family and community social capital and health risk behaviours in young people: An integrative review. BMC Public Health, 13(1), 971. Mears, D.P., & Travis, J. (2004). Youth development and reentry. Youth Violence and Juvenile Justice, 2(1), 3-20. Miller, E.A., Paschall, K.W., & Azar, S.T. (2017). Latent classes of older foster youth: Prospective associations with outcomes and exits from the foster care system during the transition to adulthood. Children and Youth Services Review, 79, 495-505. Munson, M.R., & McMillen, J.C. (2009). Natural mentoring and psychosocial outcomes among older youth transitioning from foster care. Children and Youth Services Review, 31, 104-111. Nesmith, A., & Christophersen, K. (2014). Smoothing the transition to adulthood: Creating ongoing supportive relationships among foster youth. Children and Youth Services Review, 37, 1-8. Newton, R.R., Litrownik, A.J., & Landsverk, J.A. (2000). Children and youth in foster care: Disentangling the relationship between problem behaviors and number of placements. Child Abuse & Neglect, 24(10), 1363-1374. Paulsen, V., & Berg, B. (2016). Social support and interdependency in transition to adulthood from child welfare services. Children and Youth Services Review, 68, 125-131. Perry, B. (2006). Understanding social network disruption: The case of youth in foster care. Social Problems, 53(3), 371-391. Phillips, L.A., Powers, L.E., Geenen, S., Schmidt, J., Winges-Yanez, N., ... & Bodner, C. (2015). Better Futures: A validated model for increasing postsecondary preparation and participation of youth in foster care with mental health challenges. Children and Youth Services Review, 57, 50-59. Pottick, K.J., Bilder, S., Vander Stoep, A., Warner, L.A., & Alvarez, M.F. (2008). US patterns of mental health service utilization for transition-age youth and young adults. The Journal of Behavioral Health Services & Research, 35(4), 373-389. Powers, L.E., Geenen, S., Powers, J., Pommier-Satya, S., ... & Swank, P. (2012). My Life: Effects of a longitudinal, randomized study of self-determination enhancement on the transition outcomes of youth in foster care and special education. Children and Youth Services Review, 34, 2179-2187. Salzer, M.S., Brusilovskiy, E., Prvu-Bettger, J., & Kottsieper, P. (2014). Measuring community participation of adults with psychiatric disabilities: Reliability of two modes of data collection. Rehabilitation Psychology, 59(2), 211. Samuels, G. M., & Pryce, J. M. (2008). "What doesn't kill you makes you stronger": Survivalist self-reliance as resilience and risk among young adults aging out of foster care. Children and Youth Services Review, 30(10), 1198-1210. Scales, P.C., Benson, P.L., Oesterle, S., Hill, K.G., Hawkins, J.D., & Pashak, T.J. (2015). The dimensions of successful young adult development: A conceptual and measurement framework. Applied Developmental Science, 20(3), 150-174. Seita, J., Day, A., Carrellas, A., & Pugh, G.L. (2016). Assessing the Help-Seeking Behaviors of Foster Care Alumni within their Own Social Networks. Journal of Sociology, 4(2), 1-10. Shook, J., Goodkind, S., Pohlig, R.T., Schelbe, L., Herring, D., & Kim, K.H. (2011). Patterns of mental health, substance abuse, and justice system involvement among youth aging out of child welfare. American Journal of Orthopsychiatry, 81(3), 420-432. Shpiegel, S., & Ocasio, K. (2015). Functioning patterns among older adolescents in foster care: Results from a cluster analysis. Children and Youth Services Review, 58, 227-235. Singer, E.R., Berzin, S.C., & Hokanson, K. (2013). Voices of former foster youth: Supportive relationships in the transition to adulthood. Children and Youth Services Review, 35, 2110-2117. Skowyra, K., & Cocozza, J.J. (2006). A blueprint for change: Improving the system response to youth with mental health needs involved with the juvenile justice system. Delmar, NY: National Center for Mental Health and Juvenile Justice. Sowers, J.A., Powers, L., Schmidt, J., Keller, T.E., Turner, A., Salazar, A., & Swank, P.R. (2016). A randomized trial of a science, technology, engineering, and mathematics mentoring program. Career Development and Transition for Exceptional Individuals, 40(4), 196-204. Steinberg, L., Chung, H.L., & Little, M. (2004). Reentry of young offenders from the justice system: A developmental perspective. Youth Violence and Juvenile Justice, 2(1), 21-38. Teplin, L.A., Abram, K.M., McClelland, G.M., Dulcan, M.K., & Mericle, A.A. (2002). Psychiatric disorders in youth in juvenile detention. Archives of General Psychiatry, 59, 1133-1143. Unrau, Y.A., Seita, J.R., & Putney, K.S. (2008). Former foster youth remember multiple placement moves: A journey of loss and hope. Children and Youth Services Review, 30, 1256-1266. Vaughn, M.G., Ollie, M.T., McMillen, J.C., Scott, L., & Munson, M. (2007). Substance use and abuse among older youth in foster care. Addictive Behaviors, 32(9), 1929-1935. Vaux, A., Phillips, J., Holly, L., Thomson, B., Williams, D., & Stewart, D. (1986). The social support appraisals (SS-A) scale: Studies of reliability and validity. American Journal of Community Psychology, 14(2), 195-218. Walker, J.S. (2015). A theory of change for positive developmental approaches to improving outcomes among emerging adults with serious mental health conditions. The Journal of Behavioral Health Services & Research, 42(2), 131-149. Walker, J.S., Seibel, C.L., & Jackson, S. (2017). Increasing Youths' participation in team-based treatment planning: The Achieve My Plan enhancement for Wraparound. Journal of Child and Family Studies, 26(8), 1-11. Wasserman, G.A., McReynolds, L.S., Ko, S.J., Katz, L.M., & Carpenter, J.R. (2005). Gender differences in psychiatric disorders at juvenile probation intake. American Journal of Public Health, 95(1), 131-137. Webber, M., & Fendt-Newlin, M. (2017). A review of social participation interventions for people with mental health problems. Social Psychiatry and Psychiatric Epidemiology, 52(4), 369-380. Woodgate, R.L., Sigurdson, C., Demczuk, L., Tennent, P., Wallis, B., & Wener, P. (2017). The meanings young people assign to living with mental illness and their experiences in managing their health and lives: A systematic review of qualitative evidence. JBI Database of Systematic Reviews and Implementation Reports, 15(2), 276-401. Wulczyn, F., Kogan, J., & Harden, B.J. (2003). Placement stability and movement trajectories. Social Service Review, 77(2), 212-236. Yates, T.M., & Grey, I.K. (2012). Adapting to aging out: Profiles of risk and resilience among emancipated foster youth. Development and Psychopathology, 24(02), 475-492. Blakeslee, J. (2018). Social Network Enhancement Strategies to Address Limited Support Networks in Young Adulthood: State of the Science. Portland, OR: Research and Training Center for Pathways to Positive Futures, Portland State University.